GOOD MORNING my sweet friends & welcome to day 2 of our sneaky peeks for Oct! Today we are showcasing a new set called: "Boughs of Holly". This set includes a total of 26 stamps & 19 dies! It's a BIG ONE! Everything you see for my first card, are all from this new set! I also used my Stitched Rectangular Frame Dies & More for the base layer of my card! I also used some Liquid Applique for my snow! Here is a close up of how I used the stamps & dies together! We will be giving away the sets we are showcasing each day to ONE lucky winner! For example, the set we are showcasing on Wednesday, I will announce the winner of that on Thursday & the sets we are showcasing on Thursday, I will announce that winner on Friday in her video! Love all three projects but that first card has captured my heart! Love the paper choices - just perfect! The use of the washi tape on the side. Gosh I love that card. Looks like a great release! Wonderfull cards and tag in your video, enjoyed it all along with my cuppa coffee this morning. And the DTeam did a wonderful job too and all so different in style and color. What a pretty Holiday release! Love the fur bows and the holly dies! Beautiful card and tag in your video!! All the the cards and tags are simply gorgeous!! I love the believe I can see myself making lots of cards and treats with these stamps and dies! I can't wait to see the complete set! You did it again ! Love it! Good Morning Miss Emma OMG girl you've totally outdone yourself with this release and it's only day 2 OMG!! I am in love with todays goodies and what you created with it is fabulous!! I love all 3 so much and your card was gorgeous!! Thanks my dear for showing all the grandeoso ways to use everything and how as always they fit right in with your oldies I love that you do this YOU so ROCK!! Now off to give some bloggy love!! Good Morning Emma! WOW do I just LOVE these dies! I can only imagine what the coordinating stamps look like! Your cards and tag are fantastic! 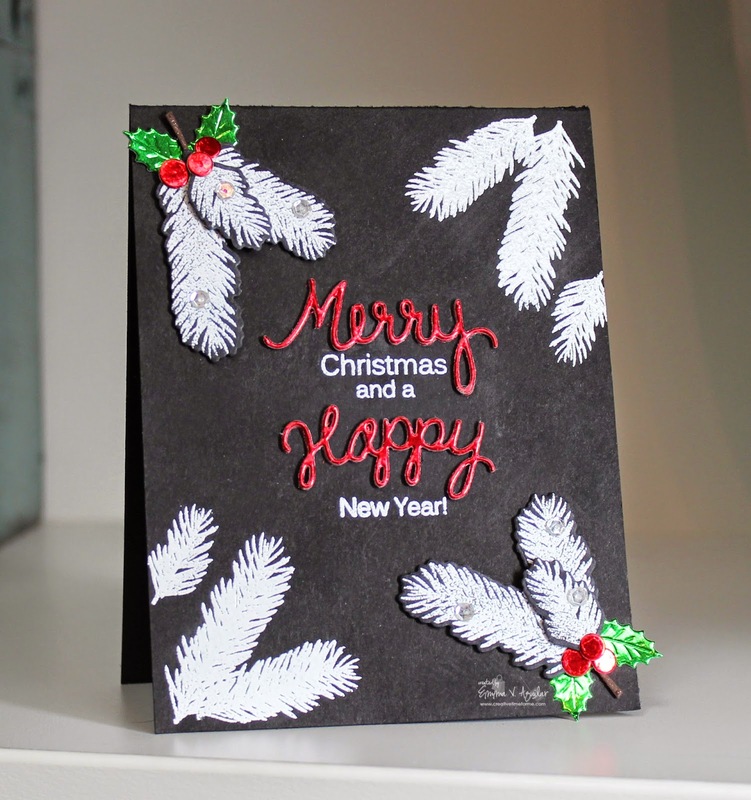 I LOVE your chalkboard look on the one card, love how you used the stamps and the dies together. The DT truly did an outstanding job on their projects using this set. I cannot wait until Friday!!!! And by the way, I just wanted to remind you that you totally INSPIRE, MOTIVATE & ROCK!!!! Have a fantastic day!!! Wow! All the projects are stunning! What a great set, Emma! WOW! How cool does this set look!! I really LOVE everything! Amazing projects from you and your design team!!! Wonderful cards. My favorite is the first. 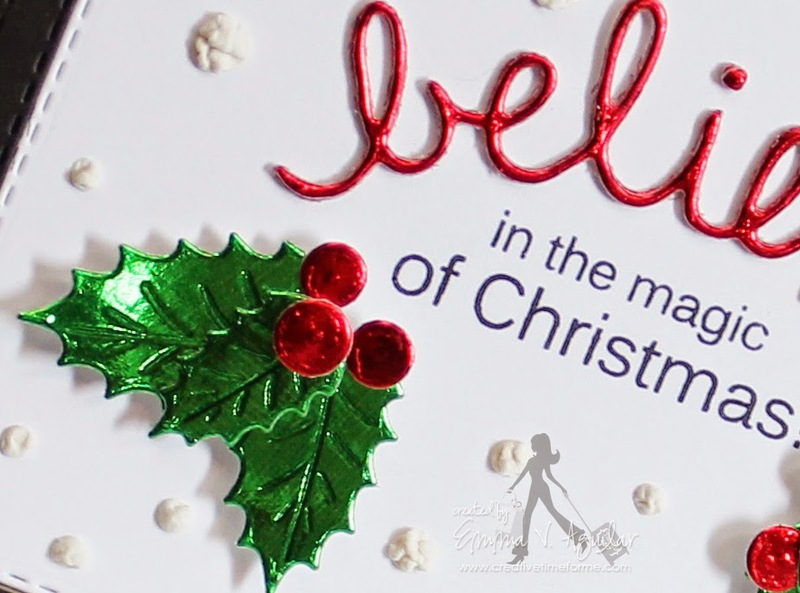 I love the thin script sentiment die and the holly leaves are gorgeous. This set has me very excited and anxious to see it. What lovely cards. I can't wait to get started on my cards. I just ordered a kit and these dies will add to it nicely. Can't wait until Friday! Gorgeous Emma...love all of your projects today...especially the chalkboard one...FABULOUS!!! Emma ~ Oh you creations are simply BEAUTIFUL and STUNNING! I LOVE that paper you used for the holly leaves! EEK! Then the tag is so PERFECTO!! But the white embossing is just so striking! BEAUTIFULLY done!! So happy Brigit is joining us this time too! She is so talented! Again the DT's did an AWESOME job! Couldn't wait to see this am!! Love all so far! Beautiful Emma!!! Love these dies and that tag you created..oh my too perfect!! Emma, your projects are wonderful, and so are the projects of your DT! 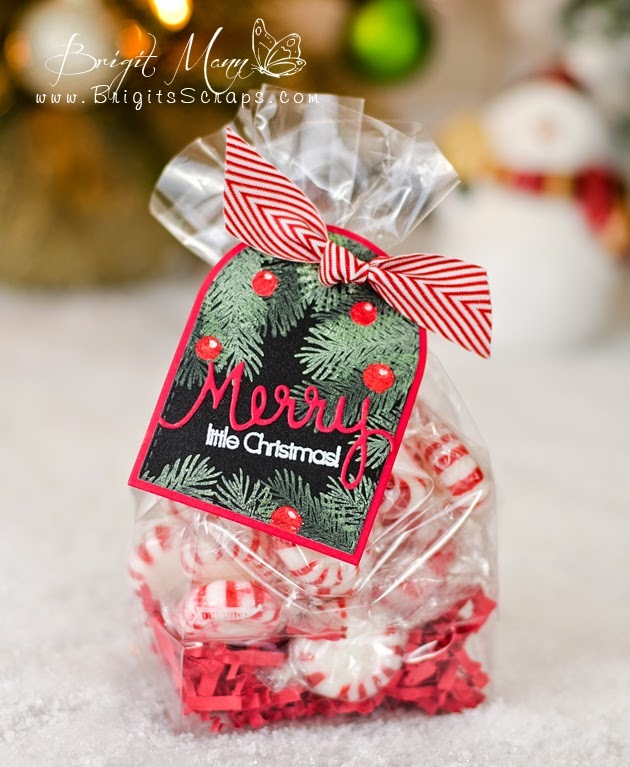 This looks like an absolute must have set -- so many dies and stamps for Christmas! Oh my goodness Emma, your cards and tag are absolutely gorgeous. Your chalk board card is beautiful. I'm loving the pine branches, soooooooooooooo pretty. Your Design Team's projects are amazingly gorgeous, as usual. Wow....this stamp set looks amazing! there are sooo many combinations possible. I LOVE that chalkboard look card! OMG Miss Emma! love your cards and tag, the new dies are fantastic! Cannot wait to get my hands on them! thanks for all the fantastic inspiration and for all you share! Wow! 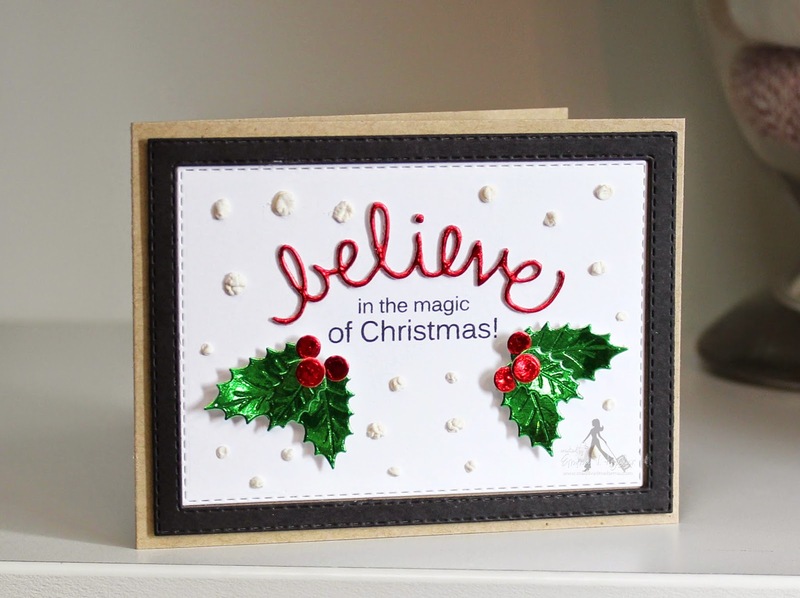 These are amazing projects, and Boughs of Holly looks like an amazing must-have set! You are certainly getting me excited about making my Christmas cards! Would love to get this one. thanks for sharing your creativeness with us. So beautiful! Got to have this one! Can't wait to place my order! This set looks great! Love all of the projects! Beautiful cards and tag. I continue to be in awe of the amazing projects from you and your design team. Friday can't come soon enough! Your cards and tags are amazing Emma! WOw, another fantastic day of inspiration! I am lovin' all the new goodies here today!! Can't wait to see more... :) Love it! Your projects are so awesome and I just love all the DT inspiration! I listened to your video in the car on my Bluetooth....you were part of my morning ride :) awesome job Emma! You're the best! This kit looks amazing to work with. Love the way it seems interchangeable for lots of options. Pretty Christmas projects! Emma ~ These projects are FABULOUS!! This release just gets better and better (and its only Day 2!!). WOW!! I am in AWE!! Wow Emma! Love these new dies and I know the stamps will be awesome too. Your projects are gorgeous! You did an amazing job as you always do. Cannot wait till Friday! TFS and have a great day! Love this fabulous die and stamp set. Your projects, as well as the DTs, are all amazing! So much inspiration. Really cute projects, especially like the tags and the chalboard one is on point; tfs! Your cards are so pretty. Love the tag. thanks for having the hop and for sharing wonderful projects. Super cute! everyone's project are amazing--another great set!! Love this stamp and die set-can't wait to try them out for myself! Another FANTABULOUS release sneak peek. Stunning work by all! Love your card and tag Emma! Cannot wait until Friday! Lovely die set. Emma, how do you do it? Amazing release! I'm thinking this is my most favorite Christmas releases!! Love these stamp set and coordinating die. You can never have too many dies! Emma Girl! 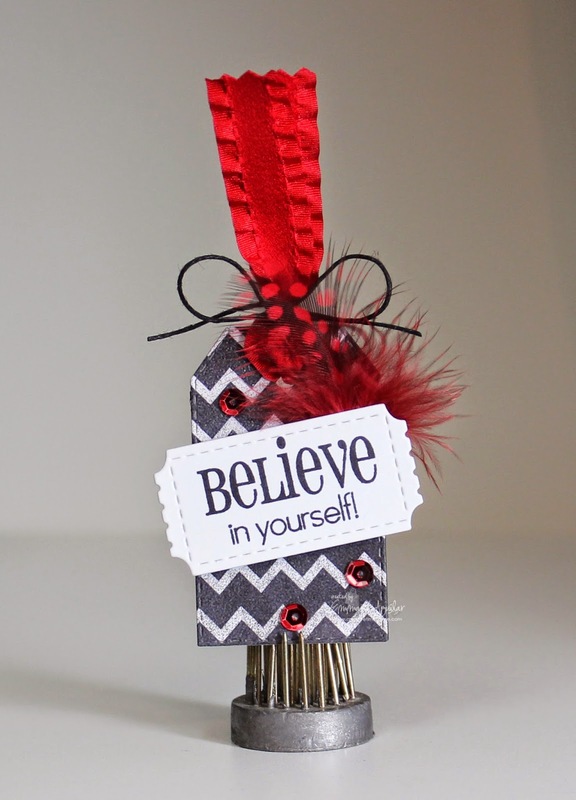 You are one Awesome Craft Genius! Love this Boughs of Holly release. Those sentiment dies are calling my name. Way to go Girlfriend! Love the word dies! The DT did a great job showcasing the new goodies!!! Great looking card. Am loving the stamped Holly. I know I am going to love this set! I LOVE this set and I really LOVE your creations Emma! They are so beautiful! The design team did an awesome job too! The white on the black is awesome. Love your projects Emma, especially the chalkboard card. Those little pine boughs are beautiful! Can't wait for this release!! what a super release Emma, the design team did an amazing job. Knock-it-out-of-the-park, home run (bases loaded *grin*) release and showcases today, Emma. Amazing products = awesome projectsl Love them all! I'll be cheering your SF Giants tonight! Gorgeous Emma!! I love that chalkboard card, how clever is that!! 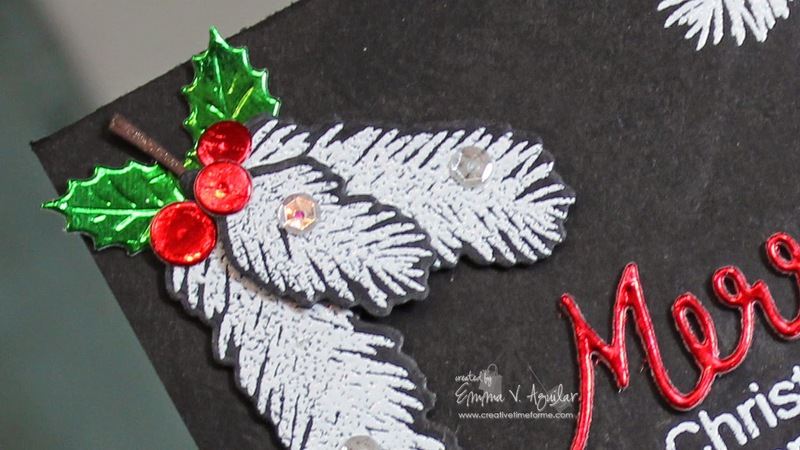 Your tag is so adorable with the feather and your Christmas card is so elegant and pretty!! Hugs my friend!! Emma I am over the moon! I won your give away and I'm in love with this release!!!! Thank you, so very much! Can't wait for my goodies. This is cute, I don't celebrate Christmas as I'm Jewish Hanukkah stamps/dies would be a winner though! OMGosh Miss Emma I LOVE your card. LOVE your color combo.Thanks for sharing. I love the holly and the berries - a perfect warm/cold holiday treat! AMAZING!!!! LOVE LOVE every single little detail!!!!! Wonderful cards and tags! Can't wait to see the whole set! Great set. Love your chalkboard card. Cute projects! Thanks for sharing your time, talents, and imagination with us. Love it. Can't wait for Friday to put my order in. I am ABSOLUTELY blown away!!!! :) Your releases are just PHENOMENAL!!!!!! It is just way too easy to want it ALL! ;) Why would I ever buy a stamp or die anywhere else? Yours are simply THE BEST!!!!!!! The set sneaked today is fabulous...love it! Great job on your cards and tag. The bough is beautiful with the berries and foil papers You and your wonderful team had beautiful projects. Awesome tag and card Emma!! Great projects from the DT!! Emma!! you did it again, this release is a HIT! Love your work, so inspirational to every one of us!